Marine mammals produce many kinds of sounds that are associated with reproduction. For example, males of some species produce vocalizations to compete with other males or to attract females. In the latter case, some females, such as female elephant seals, compare males based on vocalizations. In other species, like the North Atlantic right whale, females produce sounds that advertise their presence or reproductive status. A well-known example of marine mammals using sound as a reproductive advertisement comes from humpback whales. Humpback males produce a series of vocalizations that collectively form a song. It has been hypothesized that humpback song is used to attract females and/or that males use song to interact with each other. These songs can be detected many kilometers away. Humpback songs are produced most often in tropical waters during the breeding season and form a major component of male breeding behavior. Humpback males also sing along migratory routes and in the higher-latitude feeding grounds before and after the breeding season. However, these songs are not produced nearly as often or by as many individuals as on the breeding grounds. Humpback songs are complex in structure and long in duration. Whales have been known to sing for hours. A typical humpback song is made up of three to nine themes sung in a particular order. It takes approximately 10-15 minutes for a whale to sing a series of themes before returning to the beginning. Each theme is composed of a unique phrase that is repeated until the theme is changed. Each phrase is composed of repeated patterns of song units. For example, the spectrogram below includes about four minutes of one male’s song. In this segment, he transitions through 3 different themes. Several song units and phrases are labeled within theme 1. 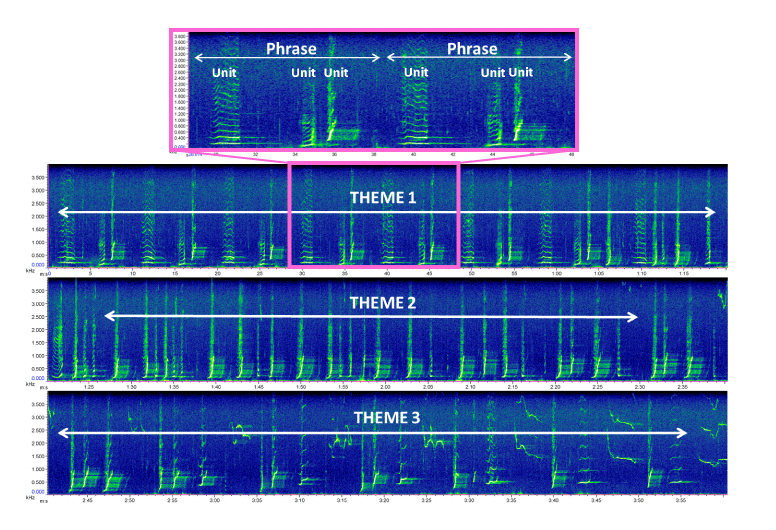 Spectrogram of a humpback whale song, showing 3 themes with phrases and units within theme 1 labeled. Image credit: Danielle Cholewiak, NOAA/NMFS. Males between breeding grounds in the same ocean basin all sing similar songs. For example, males in breeding areas off Mexico, Hawaii, and Japan sing similar songs. However, these songs change gradually over time, on a monthly and yearly basis. It is not completely known how or why the song themes continually change, but it is likely related to sexual selection and the function of the song within the breeding system. This kind of song evolution is generally rare, and is known from only a few other species. 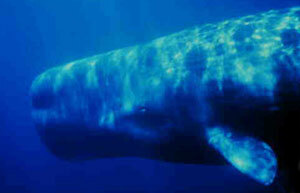 Sperm whales also produce sounds that are associated with mating and reproduction. Males produce very loud, low frequency clicks when accompanying a breeding group of females. Photo courtesy Hal Whitehead laboratory, Dalhousie University. Humpbacks are not the only cetaceans to produce vocalizations associated with mating and reproduction. Bowhead whales also produce songs that contain multiple song units and change over time. They do not produce songs with the same hierarchical structure as humpbacks; however, at any one time there are multiple song types present in the population, some of which are shared between individuals. Fin whales and blue whales both produce low frequency sounds that are thought to function as song, some of which are infrasonic in frequency. Both fin and blue whale songs can travel much longer distances than humpback songs, and are much simpler in structure. Male sperm whales also produce loud clicks with long inter-click intervals when accompanying a breeding group of females. These clicks differ from clicks in coda patterns in that they are much louder and not given in any repeatable pattern. 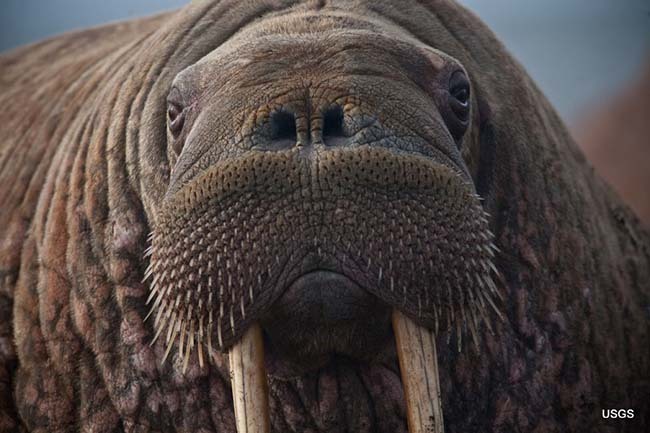 Male walruses produce a variety of underwater sounds described as knocks, whistles, and and bell-like sounds. Image credit: USGS. Tyack, P. L. (1999). Communication and Cognition. In J. E. I. Reynolds & S. A. Rommel (Eds. ), Biology of Marine Mammals (pp. 287–323). Washington D.C.: Smithsonian Institution Press. Tyack, P. L. (2000). Functional Aspects of Cetacean Communication. In J. Mann, R. C. Connor, P. L. Tyack, & H. Whitehead (Eds. ), Cetacean Societies: Field Studies of Dolphins and Whales (pp. 270–307). Chicago, IL: University of Chicago Press.